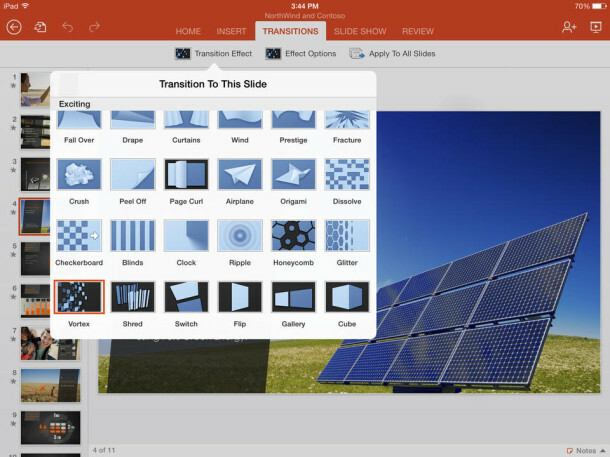 Microsoft has brought the popular Office suite to the iPad, including full featured versions of Microsoft Word, Excel, and PowerPoint. Each app is offered as a free download through the App Store for iOS, but there are some functionality differences between the free and paid subscription plans. To put it simply, the free plans of the Office apps can only view, copy, and share contents, while the paid plans are necessary to gain complete editing and new document creation across the Office suite. The Microsoft Office suite of apps for iPad works very well and they are indeed full featured with everything you’d expect to be there – assuming you get the full subscription version at least – which should make this popular amongst business, education, and corporate users, and really for anyone who exchanges a lot of documents between the Microsoft Office suite of apps in general. 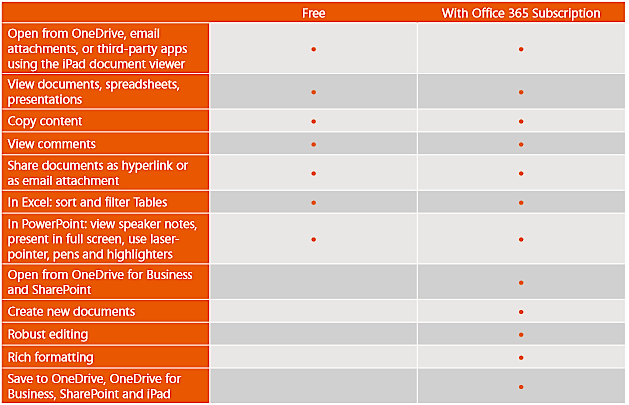 Speaking of the paid version, a years subscription to Office 365 usually costs $99/year or $10/mo, but you can get a great 33% discount if you buy Office 365 at Amazon , and there’s also a free 30 day trial available if you aren’t sure whether paying for the full version is worth the expense or not. If you’re in need of perfect compatibility with Microsoft documents while you’re toting around an iPad, the apps are well worth checking out. Even the free versions should be useful to have around for occasionally reviewing documents and files sent over from the Office world. There’s also a free version of Office Mobile for the iPhone available, which allows viewing and editing of documents, but obviously it’s a bit more limited since you’re working with a smaller screen area. More casual users who need just occasional access to view spreadsheets, take a peak at a Word document, or review a presentation, may find the free versions of Office to suffice for viewing, so long as you don’t need to do any editing. Otherwise, those who prefer to stay on the cheaper end of the spectrum may find the excellent iWork suite from Apple is sufficient for spreadsheets, word document composition, and simpler spreadsheets. Up to a few weeks ago I would have been interested in this, and indeed used to work with QuickOffice, which worked with the Microsoft formats. However, I tried out Pages on the iPad, and found it much better, and went ahead and installed Numbers and Keynote. These are in no way full featured. No style sheets, no printing. They are crippled versions. Well let’s be honest, is anyone going to really try to anything serious on an iPad? Can you imagine creating a full report and presentation on an iPad? Or entering complex formulas into Excel? LOL. This is more than enough features for a device that really is made for games and web browsing. Review your documents on the go with MS Office for iPad, sure, but no one in their right mind is going to try and get serious on an iPad. I’ll be sticking to pages, numbers & keynote thanks..
It’s certainly hard to disagree with any of the comments above. As a Word user since it appeared on the PC, I have seen the Office Suite grow into a behemoth. Working in education, I find absolutely no one in my organization using more than a tiny faction of Office’s features. Microsoft has convinced many people that they must know this application to work in the business world, but most people have a very superficial knowledge. I love Excel dearly, but I would’ve ever try doing anything complicated on my iPad. The other Microsoft apps are what they are. I am happy that Microsoft has brought its product to the iPad, but I already have the writing and spread sheet tools I need, and I am sick to death of PowerPoint. 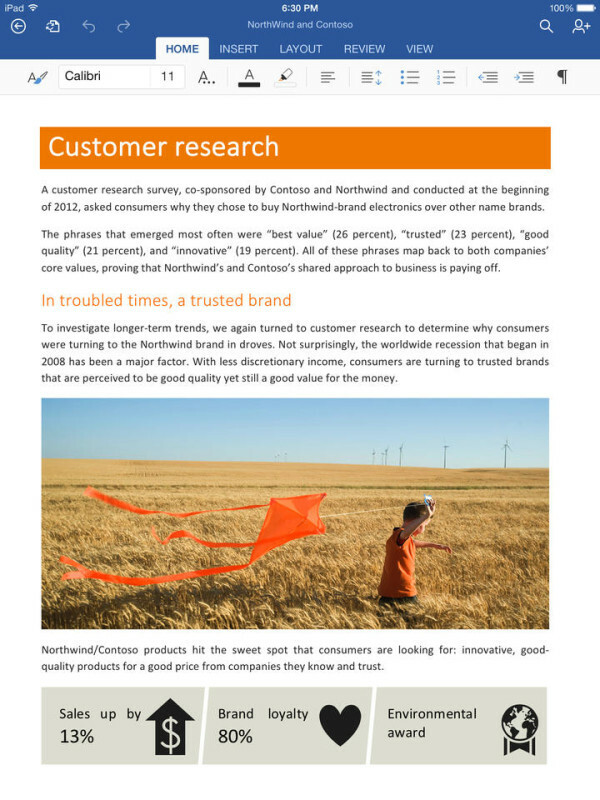 We have numbers, pages for free…. now someone please try to explain to me why would I pay for this? PS: and yes sometimes I do create document with numbers on iPad, and using simple formulas. It’s can be handy if you play with something and you create a sheet for calculating. For example: materials for crafting something etc….. Definitely not for something like yearly tax calculation, but for basic things yes. I’ve been using Docs To Go from Readdle for years and it does everything this MSOffice does for a fraction of the cost. No subscription, just one time payment. Highly recommend taking a look before forking out some subscription to Microsoft. In my opinion Microsoft is way to late and should have put out this app years ago. 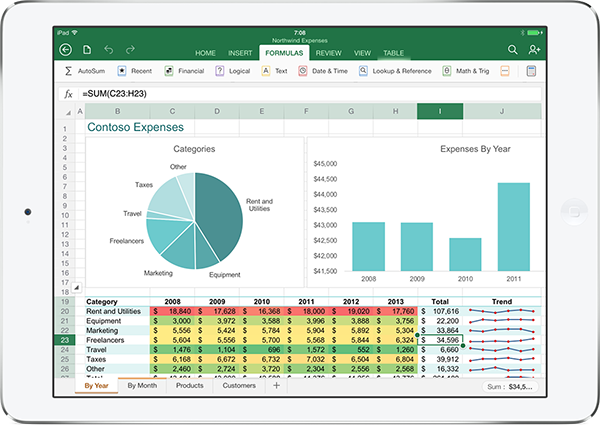 For 90% of consumers out there, I think running Excel on the iPad would satisfy the main usage for Excel which is maintaining a list of data. For the advanced formulas and other operations in Excel, the desktop version will obviously be better. This is a huge move for Microsoft as it coincides with the launch of OneDrive, Microsoft’s answer to Google Drive. We have been using Google Sheets, Google Docs, and the other cloud tools provided by Google simply because you can easily access them on the iPad and mobile devices. The one thing we are not sure about is the availability to do advanced calculations on the iPad. 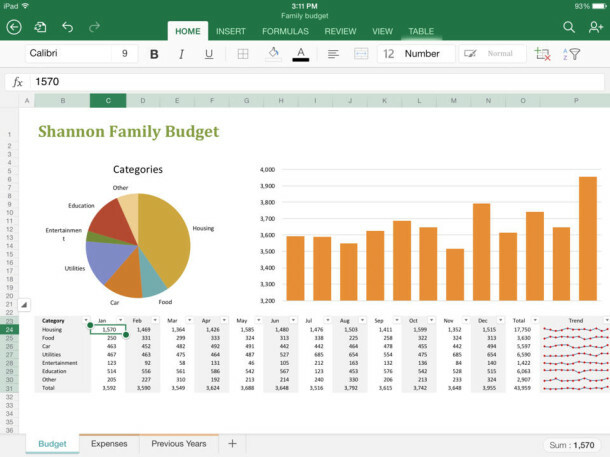 The look and feel of Excel feels similar on the iPad, but being able to do things like Excel keyboard shortcuts will probably make Excel very different on the iPad vs. desktop. In a lot of ways, this is too little, too late. On my iPad, I have Quick Office HD Pro, which costed $14.99 at the time, and I have iWork. Both will open and edit Office documents, and do so without any compatibility issues. Perhaps there will sometimes be files that won’t open and edit right, but I’ve never run into this problem. I had some customers who used Alfresco, and they were able to open and edit documents using Pages, and Numbers. They were able to save the changes back to Alfresco where other people could open and edit them again from Office on a Mac or Windows PC. Had Microsoft got it’s Office suite for iPad out soon after the iPad was released, I’m sure the situation would be different. There would not have been as high a demand for other developers to create Office compatible applications for the iPad. I think the tide has turned, and a lot of people are waking up to the fact that we just don’t need Microsoft Office anymore. I have spent my life not buying Microcrap applications and I don’t intend to do so now.